Assassin and new zombie Sebastien makes his way to the road – where he is run over by a group of stoned kids who have stolen a car. They freak out at the corpse they now have on their hands and worry about what to do – they decide to bury him. And then swear not to tell anyone about it – ever again. I’m sure this is a Horror movie plot. Sebastian, of course, isn’t dead (or not entirely) and he rises up and eats one of them – the blonde girl. Yup, definitely a horror movie trope. Actually I take back the sarcasm, this was a pure homage. To the morgue with Ravi having some creepy high school reminiscences and Liv giving him the due suspicious gaze in between contemplating her next brainy meal. Liv I also pretty dubious about how drinking “cheerleader brains” will help her tackle Blaine – which Ravi rightly calls her on, just because Kimber was a cheerleader doesn’t mean she wasn’t serious or intelligent. The band are the three other teenagers in the car that day. Through the sarcasm and excuses they manage to be super suspicious with their rehearsed alibis – and Liv has a vision of Kimber in the car with them and Kimber and Nate (one of the band) were “fooling around”. Liv goes home and Peyton is there! She hasn’t been banished to the plot box! And they talk and are all friendly (albeit with a heavy amount of cheerleader brain ruling). Back at work Clive has put some clues together and guessed the teenagers stole a car – so they go back to the band only to find the place wrecked and one of the members, Nate, dead inside. Though when they get him to the slab none of his brains have been removed. Liv finds it doubtful that a zombie, especially in full-on zombie mode, would pass up perfectly good brains. Clearly more brain eating is involved – on a pizza she shares with Ravi (not the brains. And yes he can eat pizza around brainy bits, he’s a pathologist). Ravi has also created another zombie rate to experiment on. Clive arrives and is upset they’re having a pizza party without him – and eats a slice of pizza with brains. Uckies uckies. He puts the odd texture down to mushrooms. Anyway Clive has new clues including Nate being lured to his death and Cameron, another band member, becoming the next suspect. Nate is a stoner which carries over to Liv along with her having a vision of Cameron and Nate arguing over going to the cops. Now Clive has to deal with a whole new personality Liv. Stoner Liv does amuse me when the band’s drummer, Teresa comes to the police station. She’s worried she’s going to be targeted next and tells them all about running over Sebastian. She’s also watched I know What you did Last Summer. Sebastian has snuck into Liv’s flat – and knocked Peyton unconscious! Liv is not even slightly happy but he’s even more furious – because Liv turning him into a zombie led to him eating his beloved Aunt Edna. For a guy we’re supposed to hate his emotion is really powerful. Liv isn’t impressed “I haven’t eaten anyone I didn’t want to eat” (not entirely true but still). They fight and Liv gets several horrible looking knife wounds and she seems to be losing before she pulls out Full On Zombie Mode as well, beats him repeatedly – and stabs him in the head. I think that’s a zombie killer. And Peyton saw it all. Including Liv removing a knife blade from her hand. Peyton is truly horrified and Liv has to try and gently explain zombiehood to her. She tells her the massive news then gives her space to get her peroxide for her cut head. When she comes back, Peyton is gone. To Blaine and he’s giving his now vocal-chord-damaged minion grief over not finding the missing brains – afterall he didn’t kill a national hero without some expectation of pay off. Major goes zombie hunting – first by making a terrible vlog then by posing as a health inspector (because it’s not like Julian would recognise you, right, Major? Aaaie every choice this man makes! EVERY CHOICE!). When Julian hears about it later he’s very suspicious and suspects that impossibly good looking health inspector may be impossibly good looking Major – but Blaine is too focused on his missing astronaut brains to care. 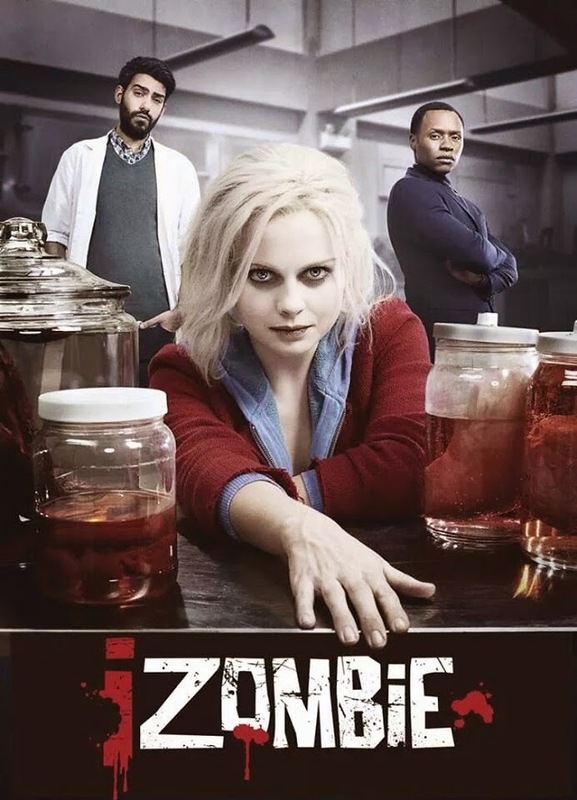 I’m also impressed iZombie made a point of making Sebastian care – of not just making a cookie-cutter villain but having him genuinely tormented by what becoming a zombie did to him. I’m really impressed with how the actress really works those brain personalities – yet at the same time don’t want to give the show points for Ravi and Liv both poking at judgemental stereotyping when the brains nearly always produce blatant stereotypes.